At 276.62 miles in length, Washington's portion of Interstate 5 is the shortest. Interstate 5 in the Evergreen State stretches from Vancouver, part of the Portland metropolitan area, in the south to the U.S.-Canadian border at Blaine in the north. In between, Interstate 5 travels through the roughly 80-mile long urban corridor from Olympia to Everett which is home to nearly two-thirds of the state's population. It is fair to say that the majority of Washington residents live close to this important freeway. Interstate 5 replaced the routing of U.S. 99 in most of the state. Unlike California and Oregon, which each kept large portions of the original U.S. 99 as state routes, only a very small section of the old US highway was designated as a state route in Washington. 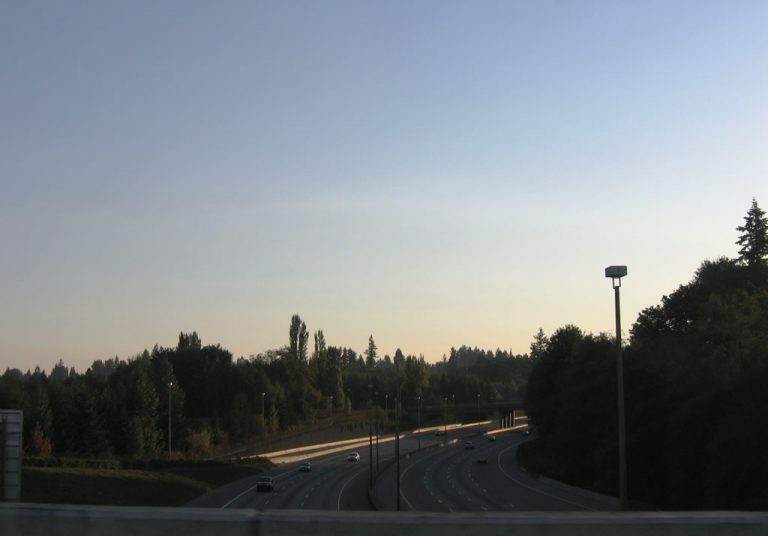 Interstate 5 curves east from Exit 105 and the State Capitol area and passes under Eastside Street SE in this scene from the 14th Avenue SE overpass. Photo taken 09/02/06. Interstate 5 at Exit 46 (Headquarters Road) near Castle Rock. Photo taken 09/02/06. Business Loop I-5 begins at Exit 48 in southeastern Castle Rock. The business route follows Huntington Avenue northwest into the city center. Photo taken 09/02/06. Business Loop I-5 (Huntington Avenue) north at the southbound on-ramp to Interstate 5 and Pleasant Hill Road (a west side frontage road). Huntington Avenue crosses over the BNSF Railroad beyond the intersection. Photo taken 09/02/06. Looking upwards from Interstate 5 southbound at the eastbound conclusion of Washington 432 (Exit 36). Washington 432 constitutes an expressway spur west to Longview from Interstate 5. Old Pacific Highway (former U.S. 99) stems southeast from the three-quarter cloverleaf interchange to Carrolls. Photo taken 09/02/06. Headquarters Road eastbound within the diamond interchange at Exit 46. Headquarters Road meanders northeast from Pleasant Hill Road and Interstate 5 to Silver Lake Road, south of SR 504. Photo taken 09/02/06. Trosper Road westbound at the parclo interchange with Interstate 5 (Exit 102). U.S. 99 utilized Trosper Road between Capitol Boulevard and Interstate 5 south from Exit 102 for a period of time during the 1950s. The freeway north from Trosper Road opened jointly as Interstate 5 and U.S. 99 in 1958.1 Photo taken 09/02/06. Bow Hill Road eastbound within the diamond interchange at Exit 236. Photo taken 08/30/06. Bow Hill Road leads west from Old U.S. 99 and the Jarman Prairie to meet Interstate 5 at the Upper Skagit Indian Reservation. 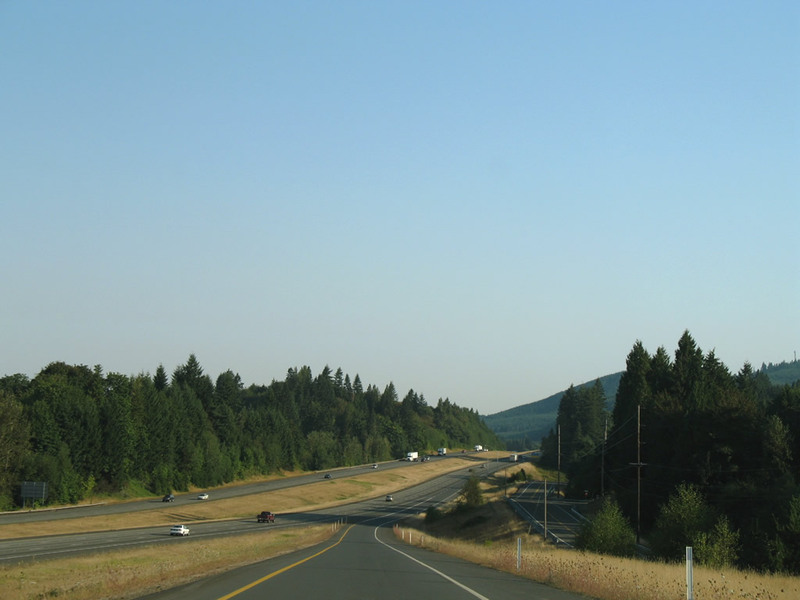 Interstate 5 heads north to Bellingham and south to Mount Vernon. Photo taken 08/30/06. Drivers bound for Interstate 5 south to Everett and Seattle depart Bow Hill Road west. Bow Hill Road continues otherwise to Bow and Washington 11 (Chuckanut Drive). Photo taken 08/30/06. Lakeview Drive sees direct ramps with Interstate 5 south. Connections to Interstate 5 north require a turn onto King Street to ramps at Potter Street. Photo taken 08/30/06. Potter and King Streets intersect opposite the northbound on and off-ramps to Interstate 5 at Exit 253. Photo taken 08/30/06. Interstate 5 northbound freeway entrance from the Potter Street on-ramp in Bellingham. The freeway ends in 23 miles at Blaine. Vancouver, British Columbia is the main control city north of Seattle. Photo taken 08/30/06. Lakeway Drive, in Bellingham, passes under Interstate 5 (Exit 253) and approaches the southbound on-ramp to Mt. Vernon and Seattle. Photo taken 08/30/06. D Street becomes SR 548 south (former U.S. 99) at Exit 276 in Blaine. The northbound on-ramp leads directly to the Canadian customs and immigration station ahead of B.C. 99 north to Delta, Richmond and Vancouver. B.C. 99 derives its number from former U.S. 99, which originally passed by the Peace Arch into Canada. Photos taken 08/30/06. Northbound travelers remaining along Interstate 5 beyond Exit 276 enter Peace Arch State Park. The speed limit remains 35 miles per hour, and this small park is located between the two customs stations (one for the United States, the other for Canada). Pedestrians are permitted to walk across the highway to view the Peace Arch (which is visible in the background), and a crosswalk cuts across the northbound lanes between the state park parking area and the arch. Photo taken 08/30/06. Tongue Point at the end of Semiahmoo Spit appears in view from Peace Arch State Park. Waters of the Strait of Georgia and mountains of Vancouver Island rise beyond the waters of Semiahmoo Bay. A short official use only access road connects the north and southbound roadways of the road between Interstate 5 and B.C. 99. Photo taken 08/30/06. Stone monuments along each side of the connecting highway between Interstate 5 and British Columbia 99 indicate the border between the United States and Canada. The words "Treaty of 1925" and "International Boundary" are inscribed into the two granite monuments as well as the names of the two countries. The Peace Arch falls along the International border within the grassy median. Photos taken 08/30/06. Situated midway between the roadways of Interstate 5 / B.C. 99, the Peace Arch rises dramatically between two trees on the International border. The arch acts as a large doorway, connecting the United States and Canada. The phrase "Children of a Common Mother" refers to the history of both countries once belonging to the British Empire. Photo taken 08/30/06. Motorists continuing beyond the border monuments enter the Canadian customs station. Beyond the facility is the beginning the B.C. 99 freeway and city of White Rock. Prior to the mid-1960s, the numerical designation between the U.S. and Canadian routes was the same: U.S. 99 and B.C. 99. Despite the renumbering of U.S. 99 as I-5, British Columbia retained 99. Photo taken 08/30/06. The U.S. Customs Station is located along the road connecting B.C. 99 with Interstate 5 southbound after the international border adjacent to Peace Arch State Park. Photo taken 08/30/06. US 99 Trunk (Mark Bozanich).